Two pranksters in Nuneaton, Warwickshire have accomplished a pretty weird, yet interesting, prank on a British KFC recently. The two guys pulled up on a moped. One got into position with a camera; the other got into position with a live chicken. When a car pulled up to the drive-through window, the live chicken got thrown into the KFC via the open window. 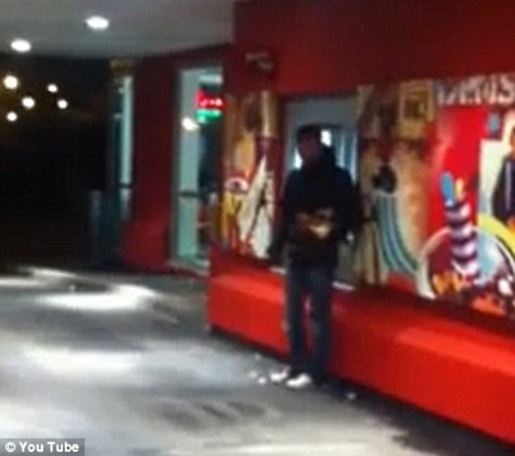 Wisely, the pranksters took off running afterwards, to avoid their KFC-brand beating. You have to wonder who was more surprised, the hen that gets thrown into the window or the poor person behind the window who gets a chicken thrust into their face? I’d say the chicken, since I’m sure the drive-through person has seen a lot of weird things while working at the chicken shack. Still, a live chicken would be pretty distracting, especially since the bird was probably scared out of its mind by the sudden change of scenery.